Dog 2: In these two scenes a faithful dog is first shown trying to save his master from an attacker, and next identifying the murderer before the king. 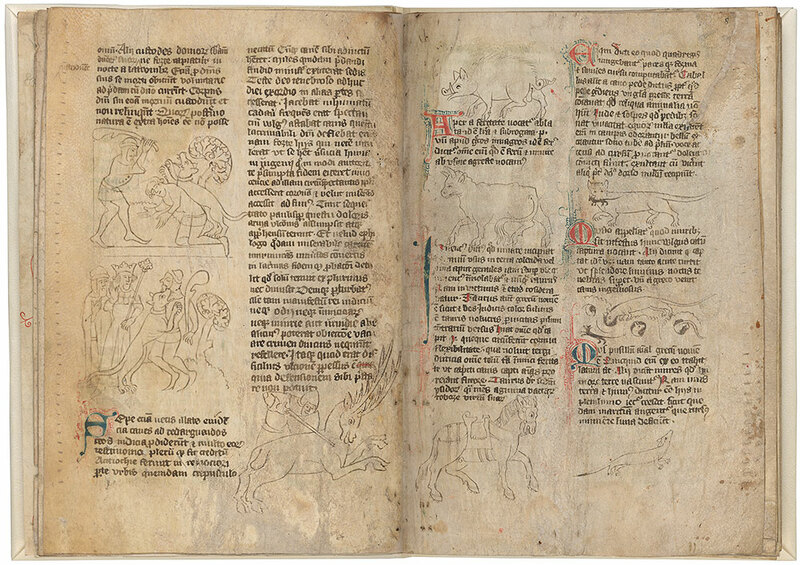 Stag: The text about deer is missing from this bestiary, even though the illustrator includes an intriguing drawing of a hunter taking down an impressive 11-pointed stag. Boar: This curly-tailed boar illustrates a short passage informing us that the animal was named for its wildness. Bullock: According to the text, certain young bulls, such as the Indian Bullock, are not only agile but have thick hides which make them impervious to injury. Horse: According to the text this stallion, shown with teeth bared, can smell war. The details of the caparison, horseshoes, and saddle refer to the absent rider, to whom horses are said to have been fiercely loyal. Cat: A cat with a recently captured mouse in its mouth demonstrates the effectiveness of its keen eyesight, which brings the skillful hunter success at night as well as in daytime. Mouse: Mice running through underground tunnels illustrate the text, which informs us that the rodents are born from the soil and live in the soil. Weasel: The weasel walking with its nose pointed upwards may be seeking its lost offspring; if they are able to find them, the text tells us, weasels are able to revive them from the dead.